A 24″ deep porch with a traditional curving roof and solid steel ironwork supports. Shown with 18″ straight wall trellis panels and circular planters. An ideal design for a typical townhouse front door requiring a traditional porch design. 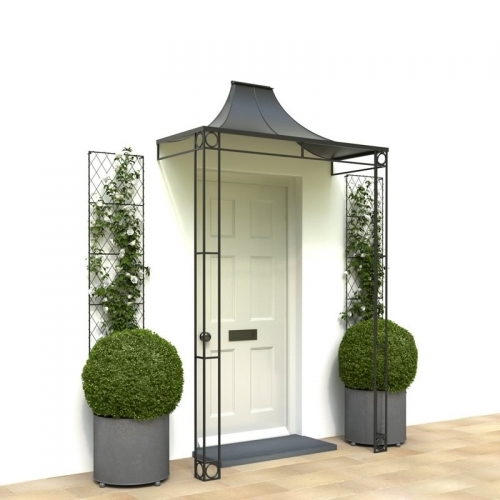 Our solid steel Traditional porch is hot dip zinc galvanized before painting matt Black or Grey, or can be Aged to achieve a mellow zinc patina that looks like a lead roof. We can modify the width of the porch roof and the height of the sides to suit your doorway. The 24” high roof projects 24” but can be increased to 30”. The roof has a lip to guide rainwater sideways. Our porch has made all the difference to the front of our London townhouse, the roof in aged zinc and the ironwork in black was the best combination, thank you.